Certified Mining & Construction Sales & Rentals has a fully licensed mechanical shop. We are fully capable of servicing all makes and models of vehicles. CMC will also service heavy duty machinery and specialized underground machinery. 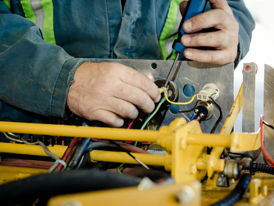 At CMC we offer fleet mechanical services to all of our clients. With regular inspections and maintenance of vehicles you can potentially lower the chances of costly breakdowns and repairs. Certified Mining & Construction Sales & Rentals is proudly Saskatchewan owned and operated.